Through vibrant colour and myriad forms of life, I attempt to present a unique view of the underwater world beyond the Newfoundland shoreline - the seabirds along its rocky cliffs and its bogs, forest and fields inland. The surface teems with details from the natural environment, but captures the duality of its fragility and durability under the harsh conditions on this edge of Canada. Through direct observation of the environment, I build up a storehouse of experiences and memories - supported by reference photographs and scientific fact - that are the catalyst for my paintings. From artist statement in Discovery exhibition publication, organized by the Discovery Consortium, St. John's, NL, 1997. Diana Dabinett is a visual artist who works and lives in Shoe Cove, Newfoundland and Labrador. Dabinett was born in 1943 at Bulawayo, Rhodesia (now Zimbabwe), in central Africa. In 1963, she received a Bachelor of Fine Arts degree from Cape Town University in South Africa. In the following years, she taught at high schools in Zimbabwe and England. While in England, she met and later married Pat Dabinett. The couple moved to Canada in 1969, and settled in London, Ontario, where she was employed for four years as assistant curator at the Art Gallery of London (now the London Regional Art and Historical Museums). The Dabinetts moved to Newfoundland in 1975, and she began a career as a fulltime practicing artist. Dabinett is a painter, sculptor, and fibre artist. 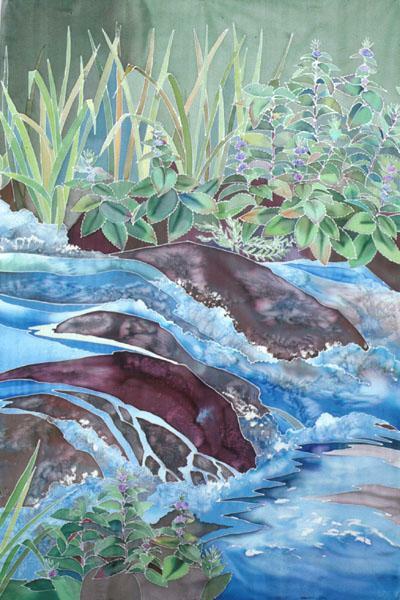 She was trained in oil painting, carving, and printmaking, but works primarily with water-based materials, such as dye on silk and watercolour on paper. 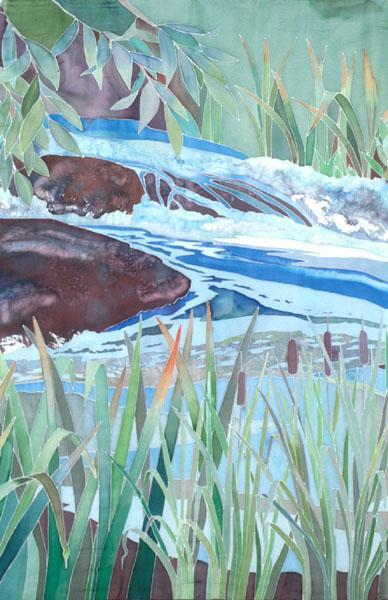 Inspired by the Newfoundland environment, she depicts subjects such as plants, bogs, the sea, and marine life in vibrant colour. In 1997, the Art Gallery of Newfoundland and Labrador (today The Rooms Provincial Art Gallery) exhibited Pathways, a collaborative installation between Dabinett and the artist Tara Bryan. It consisted of a series of fabric works that reconstructed the coastal paths linking both artists' communities together. The gallery space was transformed overhead and underfoot by painted silk banners of trees and cliffs, the ocean and the night sky. In 1998, Dabinett went to Hopedale, Labrador, to work as the director and facilitator of Artists and Communities, a 14-month pilot program funded by the Canada Council for the Arts and the Labrador School Board. This program united local artists and students in creating a permanent art installation in the new Amos Comenius Memorial School. The program culminated in the exhibition, Avertok: Place of the Whales, which toured provincially. It included Dabinett's own work and that of the participating artists and students. Since then, Dabinett's work has been extensively exhibited. She has had many solo shows at the Christina Parker Gallery in St. John's, which include Fractured Forms (2012), Shorelines (2009), and Ethereal (2007). Other solo shows include Internal Landscapes, at the Eptek National Exhibition Centre at Prince Edward Island in 2004-05, and Coastal Images: North and South, at the Lunenburg Art Gallery, Nova Scotia in 1992. She has also been included in scores of group exhibitions, including Open Water at Toronto's John B. Aird Gallery (2010); A Little Spring Fling at the Fog Forest Gallery in New Brunswick (2010), and Crossing Borders at the Keenan Centre in Lockport, New York. In addition to being part of The Rooms Provincial Art Gallery's Permanent Collection, her work is included in many public and private collections, including the Canada Council Art Bank, the Royal Collection at Windsor Castle, the Government of Canada, the University of Western Ontario, and the Government of Newfoundland and Labrador. 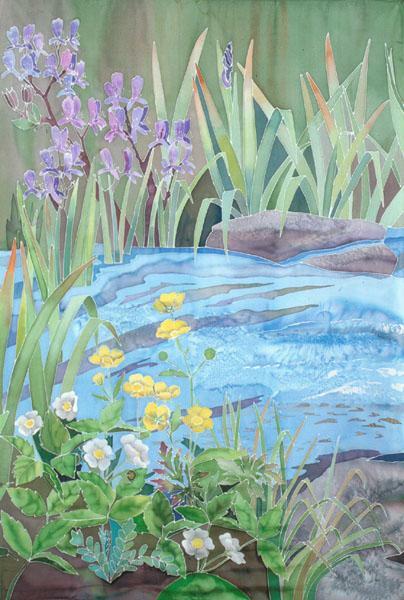 For more information on the artist or her work, visit her website: http://www.dianadabinett.ca/index.html.